I have been seriously lacking in my writing this year, an area that I am now working on rectifying. To get things going again I am going to start out with a new series based on some much needed AutoCAD basics or AutoCAD 101 topics that are good for all levels of users. After working in the AEC industry for almost 30 years and of that about 20 using AutoCAD I have learned a lot. The majority of my learning came from on the job training, with most being self teaching through books, blogs, magazine, seminars and a lot of trial and error. I have worked in Architectural, Mechanical and in current years Electrical offices for various firms and have consulted for a variety of other industries. All of this has increased my education as well – not only in AutoCAD but of the specific industries. Because of the variety of working fields and environments, I have also been exposed to a gamut of skill levels of co-workers, clients and consultants that use AutoCAD. In this time frame I have determined that one thing is clear – AutoCAD skill sets are seriously lacking. Well – these can all be overcome and the focus of this series will be to expand users knowledge of AutoCAD features that can and will improve their productivity and efficiency now. I have written numerous articles for AUGI world http://www.augi.com/augiworld on some of the topics above, including the importance of training, hiring the right people and how to be more efficient in AutoCAD. As I tend to get long winded in my writing, the goal of this series is to be present bite sized chunks of information that can be followed up prior to the next weekly post in the series. The first four posts will be all about Blocks – What they are, what they aren’t and how to make and use them. If your an Autodesk product user, whether it be AutoCAD, Revit, 3D Studio, Inventor or many of the other Autodesk software products, I would recommend you look in to becoming an AUGI member. Why would you want an AUGI membership? The website has tons of timely and historical information for the AEC, manufacturing and multimedia industries. No matter your title or position, there is something for everyone. AUGI has articles in their two publications, one of which is an email newsletter (Hot News) and one is a magazine (AUGI World) that is available as a printed version. AUGI HotNews, a monthly newsletter sent to all AUGI members via email, disseminates timely information about upcoming events, special offers from Autodesk and its third-party developer community, general announcements, and a number of columns and feature articles designed to deepen your understanding and enhance your use of AutoCAD and other Autodesk products. The AUGI Board of Directors also uses HotNews as its channel to keep the membership informed about new programs and policies being offered to the membership. AUGI HotNews…it’s the way to stay in the know. AUGIWorld is the official magazine of Autodesk User Group International (AUGI). Published every month, it is distributed to AUGI members around the world. A unique cover story with topics such as CAD Management, Salary Survey, AutoCAD add-on’s, Tips & Tricks, and more. Interviews with Autodesk or industry executives answering member questions on big issues. User stories portraying successfully implemented industry solutions. Do you regularly search for technical information online, or look for someone to provide support or guidance? AUGI forums are here for you. The AUGI forums are an online community where AUGI members can discuss what they use everyday, Autodesk Design Software! These forums are the place to ask questions about your favorite design software or help others with their questions. As you frequent these forums, please offer your own tips and share any other helpful information you might come across. You can view the forums as a guest, without being an AUGI member. But to really take advantage of what being a member of this community means, you’ll want to post. Only members can post, so if you’re just browsing now, be sure to join AUGI. These forums are one of the biggest benefits of being a member. This is, after all, the premiere destination to get technical support, and its free! There are three membership levels, Standard, Premium, and Professional. Which membership should you choose? That depends on the value that you see for each membership level. Check out the links below and join up! Another educational trip to Vegas for #AU2013! This is the third year in a row that I have been fortunate enough to attend Autodesk University in Las Vegas, Nevada and each year is more educational then the last. This year my focus was more on customization, and Revit knowledge and as usual I have a lot to brain dump when I return home. Although there were many classes that I did not get to attend (over 700 available), the ones I did attend were very good. If you did not get to attend this year, it does not mean you have missed out, as much of the information is available online by just creating an Autodesk account if you do not already have one – if you do, just login. Handouts and presentations are posted from the majority of the classes on the Autodesk University website at http://au.autodesk.com/. Much of the AU experience though really has to be experienced in person. Behind all the handouts and Powerpoint presentations were very knowledgeable and experienced instructors/presenters that brought the paper to life. Although many are instructors in their day jobs, many were everyday product users like you and me. The days started around 6:00am as you awoke and headed off to breakfast and concluded around 5:30 for classes. After that you head out for a few more hours for the evening events and vendor showcase. Some of the funner the things you did miss out on were the nightly parties and events meant for networking and relaxing after each full day of data gathering. The two biggest events being the AUGI annual beer bust on Wednesday evening and the closing Autodesk party on Thursday. The weather was cold (28F on Friday) compared to my home state of Florida, but if you spend most of your time inside like me, it won’t matter. Overall I had a great time, I attended a few evening events and enjoyed hanging out with some friends I do not get to see very often otherwise. The final party was not anything like last years event, but was still a good time with lots of food and beer/wine. I hope to make it again next year. P.S. A special thanks to Autodesk and AUGI for another great year. Are you a current member of AUGI (Autodesk User Group International)? If not, you may want to consider joining as there is a bunch of good info waiting for you at your finger clicks. If you are not familiar with the group, you may ask what it’s all about. The above comes from the ‘About‘ page of the AUGI website. Online/Email HotNews: a monthly newsletter sent to all AUGI members via email that includes technical columns, information on industry events and product offerings from Autodesk and third party vendors. Online and printed AUGI World (printed will depend on membership level) covering topics about CAD Management, add-on’s, Tips & Tricks, and more. interviews, user stories, Technical Tips & Tricks, Training advice, AUGI events and announcements and more. User Forums: a great resource for solving your Autodesk product issues, getting product information, and sharing your own knowledge and experiences. There are a wide variety of products and topics in the forums which are monitored and manged by AUGI volunteers. Access level depends on membership level – your welcome to lurk (browse) as a guest, but to post you will need at least a basic membership. Wishlist: Ever had a cool idea you wish Autodesk would add in to the product you use every day – here is your chance to make it happen. AUGI currently has a four membership levels that run from Free (non-member open access), basic at $0, Premier at $25/year and Professional at $100/year. The Professional membership has the most benefits (hence the cost), but the Premier is also a good investment. When you think about getting answers from other professionals about issues you are currently experiencing OR learning more for personal career development, the $2 to $10 a month is a very good investment. You may even be able to get your company to fund it for you – after all you are helping them out with the info and troubleshooting help you will be through AUGI. I have been a AUGI member for years and currently contribute articles to AUGI world. I got my start after being involved with a local user group (TBAUG) back in the 80’s and then joined NAUG (North American Autodesk User group), which eventually became the AUGI we have today. Are you a member already? Thinking about it? Time to get your new year started right and get your AUGI membership now! Got any questions about AUGI? – drop me an email. In my previous article I talked more about my personal experience at AU 2012 and included some whining. I am sure being sick the later half of the week did not help my attitude. I wanted to follow up with a bit more on some specifics of why AU is such a great event to attend and what you can get out of it. This is only my third time attending AU, but have wanted to go every year for as long as I can remember – it’s just hard to get some companies to foot the bill for the experience, especially when they hear it is in Las Vegas. If you are an Autodesk product user (and that covers a lot of software users), AU is a the mecca of events to learn more about your software and what is coming down the road for your industry. If like me, you have trouble getting your bosses/manager to approve and finance the trip, start working on them early – like now! Let them know what a great event you missed and how other industry folks are raving about the experience and what they learned. Check out Lynn Allen’s video on the benefits of attending AU and get the Convince Your Manager Tool Kit from the AU site and start planning now. Keep in mind, your a professional, and avoid the traps in Las Vegas – there is plenty to do at the event that has nothing to do with the Casinos and the strip. If you do get to go focus on what the event is about so that maybe next year you will get to go again! Tips and tricks from some of the best. I sat in two Tips/Tricks sessions that had over 500 people in each one! The hot items this year that I saw were cloud based work, Revit optimization and coordination and a lot about creativity. I do not know of many folks using the cloud, but it is gaining ground every year. Revit it seems is getting in to more and more offices and is gaining more acceptance. I am even thinking of submitting on a basic AutoCAD to Revit transition course for next years AU. If you couldn’t go or went but did not get to sit in all the classes you wanted (like me), there is AU Virtual. For non AU attenders, sign up for a free account at AU Virtual and check out the keynote videos and and classes from AU 2012 and start learning for free. 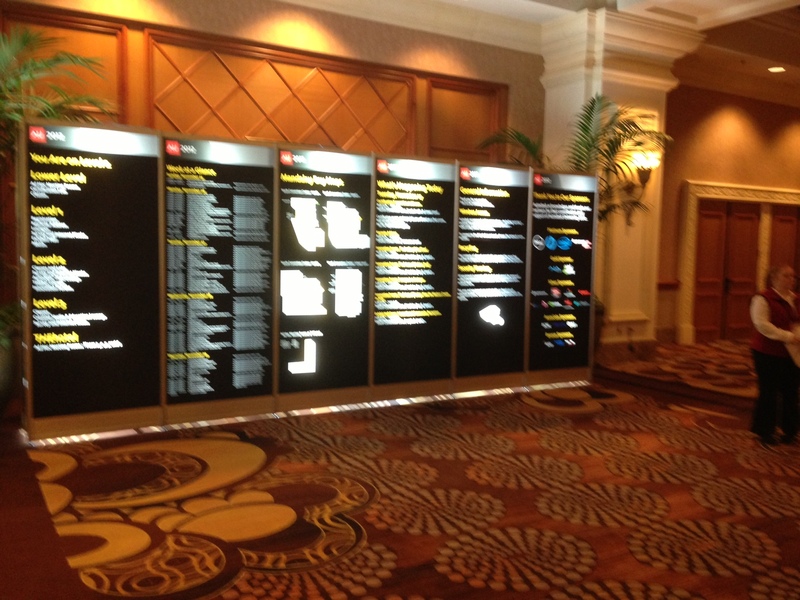 Hope to see you next year at AU 2013! The first day of Autodesk University 2012 was kicked of with the AUGI volunteer breakfast with lots of traditional high cholesterol yummy foods, awards for some of the dedicated volunteers, and discussions of changes happening within the membership area. After breakfast, it was off to get things started with the annual key-note address. Although the concept of talking about the tools and capabilities available now, instead of all about the future was refreshing, the keynote session was nowhere near as interesting or inspiring as last years. I left just before the end to check in at the office back home then headed out to start the classes/sessions. My focus this year was on learning as much as possible about Revit MEP. As our firm is stepping in to the Revit arena I signed up for as many Revit related classes as I could no matter the discipline. My first class was a bust as it was more of a sales pitch for a product that was not yet ready for the US market and the presenters, although I am sure were very competent had a major language barrier and we’re so hard to understand that I left after about 20 minutes. My second class was on creating HVAC content in Revit, but was really more about just creating content in general and was one of my favorite sessions of the trip. The last class was on migrating AutoCAD standards to Revit and was another favorite. Myself and my buddy Scott from Texas ended the evening at the Imagint customer appreciation even in the Mix lounge. The grab and go breakfast was not a good start for a day of learning, with huge muffins and slices of breakfast cakes. The carbs and caffeine pretty much set you up for a mid morning crash and the need for lots more caffeine. This days sessions we’re more on Revit optimization. Another favorite, Lynn Allen’s 90 tips in 90 minutes was very fun and educational, especially the newer versions tips. The day ended with the AUGI annual beer bust which we skipped out on in favor of a brisk walk to Outback. In lieu of beer and munches I chose a salad, steak, and baked potato with a sweet bowl if vanilla ice cream for desert and another brisk walk back to the hotel. I skipped the grab and go carb fest today and had a banana and pumpkin loaf from Starbucks (not much better). My first session was on personal branding with Curt Moreno from Kung Fu Drafter and Marielle Covington, a social media manager from Autodesk. This was also a good session. The day ended today with more AutoCAD tips from Jeanne Aurhus and then back to the room to rest for the closing AU appreciation event at the Hard Rock hotel. The closing session at the Hard Rock Hotel was quite the production. Autodesk was celebrating its 20th Autodesk University event in a big way. Think of the resources and cost to move around 5,000+ people from the Mandalay Bay Hotel alone to the Hard Rock via buses. Autodesk rented out the entire entertainment area of the Hard Rock which included about a dozen bars, dance floors and stages with live entertainment in each area. There were women dressed up in all kinds of getups from cowgirls to 10 foot tall guitar players and Vegas style dance outfits. Did I mention food in every area and open bar! Knowing I had an early flight, I contemplated not going, but I am glad I did! Every event has some great moments that create good memories and some that create bad ones and AU is no different. The all new AU app was a great way to verify my next scheduled class and location and was far better than carrying around a paper list – as long as I could get a WIFI or cellular signal. No ability to download course material from the app to me was a disappointment as I used it on both my phone and tablet. Not being able to see full course titles was another disappointment, hopefully these will be addressed by next year. Great addition to AU experience though. The grab and go breakfast was a disappointment. Lunches were really pretty good with good options for veggies, proteins and carbs. The snacks were as expected with cookies and pretzels, coffee and soda, and water was always available. This years ice cream fell far short of last years. I left a class 5 minutes after it was done and the ice cream was all gone, last year I had more than one while walking between classes. 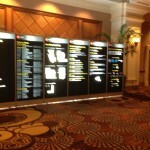 I stayed at the Mandalay Bay hotel, which made trekking to the conference easier, but still not short. You get lots of exercise at this event for sure! The room was clean and roomy, but a few things were buggy. Pillows were very uncomfortable, the bathroom door handle kept falling off and the doors the bathroom were very loud when closing which would wake up one of us if the other went in the middle of the night. We had to close them because we could not see how to turn off the lights under the bathroom counter. Wireless access sucked and my cell signal came and went. This was not a very “Connected World” experience! Overall the event was very informative and enjoyable! The bags were nicer than least years, a place to carry a water bottle or coffee thermos in my case was a nice benefit. One thing that would have been nice is to have “You Are here” stickers on the event mapping boards – with the complex being so big, it was easy to get turned around. Thanks to all the event sponsors, floor personnel, instructors and of course AUGI and Autodesk for their work and investments in keeping this going! Hope to see you next year! While reviewing an E-News Letter recently from our Autodesk vendor I came across an interesting link in their featured Blog posts that took me to an Autodesk help site. 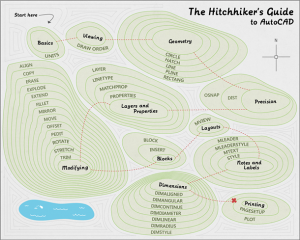 Here I found a help series labeled “The Hitchhikers Guide to AutoCAD“. Now if you are new to AutoCAD or have been a long time circle and line jock, but not much on more advanced features, this might be a good spot to start your climb. 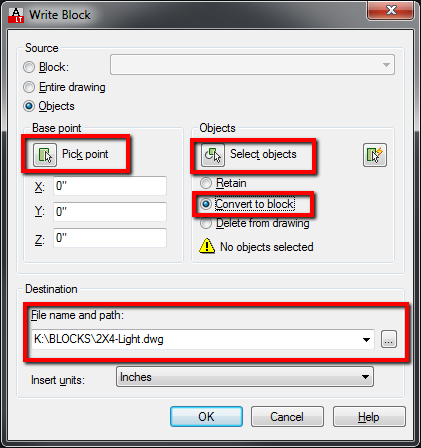 This does not by any means have the info to make you an advanced Rock Star AutoCAD user, but if there is one or more areas that you have not ventured in to, like creating your own Blocks, using Paper Space, using multileaders or Mtext, in lieu of the old Dtext that so many still use, these are straightforward, easy to understand mini-tutorials on how to so these things. Below is a basic capture of the home screen and the cool graphic that they use. Welcome to The Hitchhiker’s Guide to AutoCAD—your guide to the basic 42 commands you need to create 2D drawings using modern AutoCAD or AutoCAD LT. This guide is a great place to get started if you just completed your initial training, or to refresh your memory if you only use AutoCAD occasionally. As you can see from the illustration, the 42 commands are grouped together according to types of activity. In addition, these groups are arranged sequentially to follow a typical workflow. 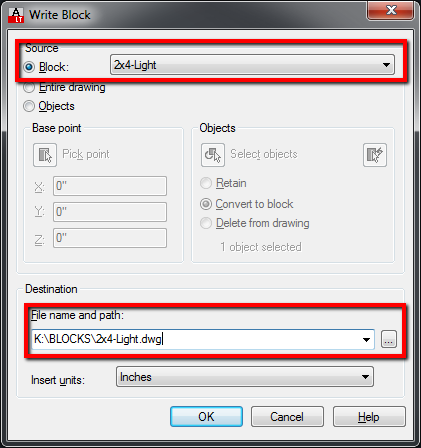 Basics: Review the basic ways to control AutoCAD. Viewing: Pan and zoom in a drawing, and control the order of overlapping objects. Geometry: Create basic geometric objects such as lines, circles, and solid-filled areas. Precision: AutoCAD provides several features to ensure the precision required for your models. Layers and Properties: Organize your drawing by assigning objects to layers, and by assigning properties such as color and linetype to objects. 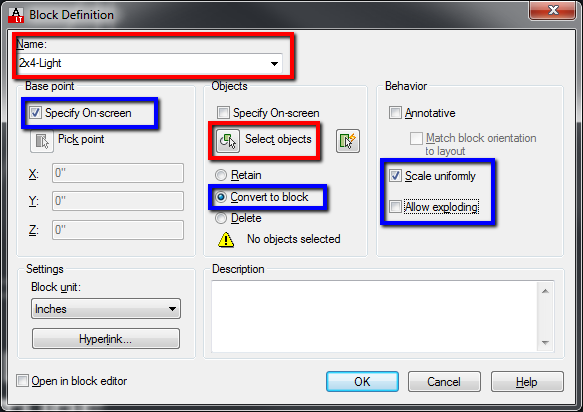 Modifying: Perform editing operations such as erase, move, and trim on the objects in a drawing. Blocks: Insert symbols and details into your drawings from commercial online sources or from your own designs. Layouts: Display one or more scaled views of your design on a standard-size drawing sheet called a layout. 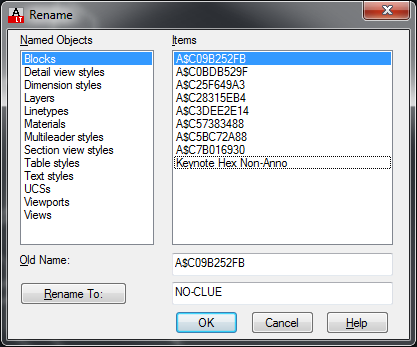 Notes and Labels: Create notes, labels, bubbles, and callouts. Save and restore style settings by name. Dimensions: Create several types of dimensions and save dimension settings by name. Printing: Save and restore the printer settings for each layout. Output a drawing layout to a printer, a plotter, or a file. If you are new to AutoCAD or a casual user, I highly recommend you check this out! Once you have checked it out and let me know what you think!